The Samsung Galaxy Beam is that very same phone with a built-in projector Samsung announced late February at Mobile World Congress and it’s finally here! At least if you’re in the UK where the Galaxy Beam is now selling for £395 (or nearly $615) off contract. With a 15-lumen projector that doesn’t make the phone excessively thick, the Beam is definitely a device that will appeal to those wanting to bring their movies and presentation everywhere with them. The projector should be the feature that you appreciate the most because otherwise the phone is a pretty standard mid-range affair, hardware-wise similar to the Galaxy Ace 2. It comes with a 4-inch WVGA screen, a 1GHz dual-core processor, 768MB of RAM and 8 gigs of itnernal storage. Looking back at history, you’d see that this Galaxy Beam is actually the second iteration on the projector phone idea by Samsung. But while the first Beam cost a lot and sold in limited markets, this one might pave the way for the technology better. What do you think, are you getting this? Hit the source below to buy it Expansys’ European locations. They are already demonstrating it in Singapore. Get ready for its launch this sunday! How come it's running gingerbread? "The projector should be the feature that you appreciate the most because otherwise the phone is a pretty standard mid-range affair, hardware-wise similar to the Galaxy Ace 2. It comes with a 4-inch WVGA screen, a 1GHz dual-core processor, 768MB of RAM and 8 gigs of itnernal storage." 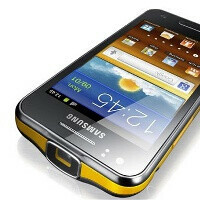 Galaxy Ace 2? do you mean Galaxy S Advance right? I would love a projector phone, only on a high end device tho. I'm not gonna sacrifice all the other specs just to have a projector.